I have dawned yet another new "on-going" project which I am dubbing the "Reformation Project". Here's what it's all about. I have been looking for a way to direct my interests in creating theatrical driven images toward something artsy. Yes that was said slightly tongue n' cheek, but it's the fact of the matter. As I sift through a very large art book we have I've noticed that a lot of great art pieces are of pivotal, important events or people. While reflecting on modern art, I recall the likes of Picaso. 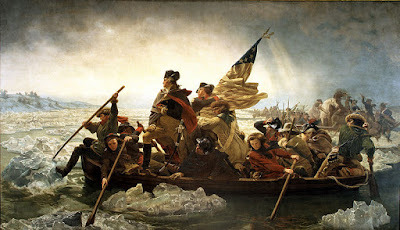 Now, while I'm not begrudging Picaso his art, I'm intrigued by comparing the difference between his work and paintings like "Washington Crossing the Delaware" painted by Emanuel Leutze in 1851. It's my intent to embark on the Reformation Project as it means to bring back a greater purpose for art. Rather than expressing one's self, I hope to express the impact God has had in history. Now, my gifting is not in oil on canvas, but I do have a gift for creating visual art via the medium of photography. To inaugurate this project my first piece will be of William Tyndale. For those not familiar with Tyndale, he set out to translate the (currently latin) Bible into English. Against much opposition he ended up having to continue his work on the European mainland and smuggle the English Bibles back into England. He was later betrayed and captured and burned at the stake as a heretic. What better historical figure could I have chosen? Tyndale is a great inspiration for me and I believe his story a great first project. If you haven't quite followed all of this, I'm planning a create photographic images of pivotal historic figures and events. The resulting images should be similar in composition to the painting above, but also very similar to the works of Rembrandt. I will be keeping this blog updated with all the happenings. I've also considered starting a special Facebook page for the Reformation Project. Stay tuned! I truly look forward to seeing this project realized! You go! If I can help, let me know. eighmmie, Thanks for the comment and offer! I'll keep you in mind. I must admit I don't recognize you from your screenname. If I know you I apologize. If you send me an email or friend me on facebook I'll be able to get in touch of effectively. David, this is awesome! Will be praying that your project will touch the hearts and minds of those who experience it. Thanks Karen, I actually have another project in mind that would benefit greatly from your experience with the Crisis Pregnancy Center. If you're interested I'd love to pitch the idea to you sometime.